In the last post I mentioned that my lovely daughter, Amber, had embroidered a Mother's Day gift for me. I hung it in the dining room and here it is. Isn't it darling! These little violas just seem to pop up everywhere and Annie loves to sniff them. I received this sweet award from Kathie at My Net Finds. Check out her blog daily for fabulous internet deals. I'm passing this award on to all my devoted blog readers. Thanks Kathie! I got an anonymous comment on my last post asking me if I'd taught my son to cook. Honestly, if I had cooked anything like that when he was young he wouldn't have touched it with a 10 foot pole! He was a very picky eater. When he went off to college and started traveling to Russia, Egypt, Germany.....etc. he had to learn to eat different types of food. He now searches the internet for recipes and has taught himself to cook. As a child he would make strange sandwiches like grilled cheese with pepperoni and I was impressed by that! I just want to let everyone know that I haven't stopped painting. I've been very busy with commissioned pieces and will get back to doing some paintings for ebay soon. I had a recent comment from Janine who lives in Germany and is also a folk artist. You can check out her blog and her artwork here. She is going to be having surgery on her foot soon and she ordered my book "Charming Village Scenes You Can Paint" so she could have something to read while she's laid up. Stop by and give her some encouragement. I never think to mention that this book is still available from Amazon. 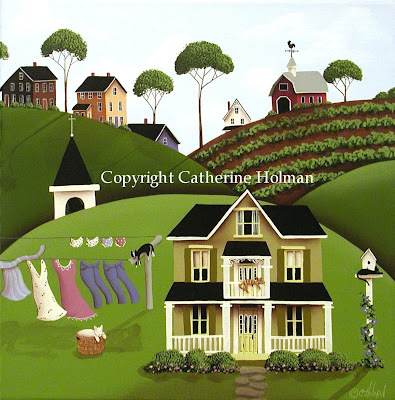 Instead of sharing a painting, here is a new print that I listed on Etsy and Ebay today: "Cat Nap"
Miss Betty's cats lazily nap around her old farm house. Oreo naps on top of the clothes line pole where laundry flaps in the gentle breeze and Peppermint sleeps in the laundry basket. Sybil rests precariously on the upper balcony railing. The birds are a lot smarter than what Licorice gives them credit for. What a lively bunch of felines! I love your daughter's gift to you! Your daughters gift is wonderful! Tell you son if he hasnt found it already to try www.epicurious.com I get great recipes there! I am impressed that she embroiders since that seems to be a lost art form. 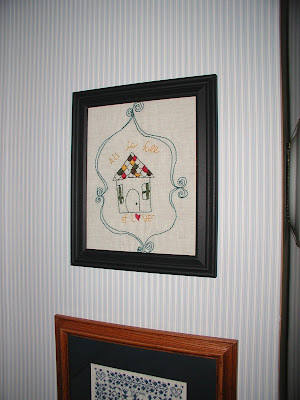 My grandmother used to embroider and crochet, too. What a nice keepsake. I didnt know you had written a book, you clever chook! How wonderful! And your daughter's gift is so cute and charming! Hi Catherine, your daughters gift is very sweet indeed. And so is the picture of your dog. Thank you for mention my blog. That is special of your daughter. A beautifui Mother's Day gift, Cathie! I also looked at your post about your son cooking for Mother's Day. Looks delish! Cathie, I love your daughter's gift to you! I also love your new painting!! I will have more wall space at the new townhouse we are moving into next month so maybe I can get some more of your lovely artwork! What a wonderful gift from your daughter! And how great to have a son that cooks! Have a great weekend, Cathie. That is a sweet gift from your daughter. Grilled cheese and pepperoni sounds sooo good. I didn't know that you had written a book. Gosh the folks that I'm visiting here in Blogland are such accomplished people! What a wonderful gift! I know you will treasure it! What a sweet gift. It's nice when the children can and want to cook. Love your beautiful doggie, Violas and your daughters needlework project. I think the laundry line in that print is fabulous! Thank you for mentioning that your book is still available on Amazon. I was wondering if any of your books were still in print so I could check them out. I absolutely loved your Mother's Day post. You are very blessed with your family. And your children are blessed as well to have a mother like you. Many mothers would not frame their daughter's picture (I just don't understand this! ).